You can introduce active learning into your course over several years, dip your toe in the pond, and decide whether to dive in. What's exciting is that people who try it seriously generally want to do a lot more." --Peter Lepage, Director of Education Innovation and Goldwin Smith Professor of Physics at Cornell University. These types of tools are fun and engaging, and they support collaboration, communication, and creativity. Clickers: Also known as Student Response Systems, these devices make it really easy to gather student feedback. Plickers: This is a relatively lo-tech, and highly affordable alternative to clickers. Learn more here. More advanced, education-specific tools: Apps like Socrative are great examples of the maturing tool set available to educators. Twitter is a unique, fun way to gather feedback when students have a way to tweet. You could say learning to teach in active learning spaces is like learning to ride a bike. But how does one combine active + learning? 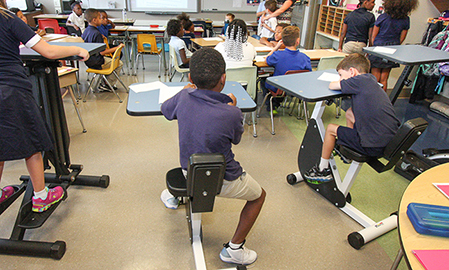 The kids in the photo above seem to be undaunted by the process of peddling and reading at the same time. The positives of teaching in active learning spaces is it includes increased learning gains and students report high satisfaction with the learning environment. However, these spaces can present a number of teaching challenges, including: a room with no front or focal point, noise and other distractions that may impact individuals, and a need for mastery of the technology. Teaching in an active learning space is likely to require an investment of time, effort, and perhaps a major shift in the way one thinks about teaching and learning. ​Let's take a look at some very popular active learning teaching strategies. Social learning tools and learning management systems position instructors to deliver content outside of the classroom, and then “flip” the classroom – working on what would have been homework during class sometimes. (Watch Salman Khan’s TED talk on the use of video). ​What active learning techniques do you use? Share a teaching technique you find highly successful in your class.